Click Here to Join Our Signature VIP Club! Get ready for insider access to upcoming promotions, events, new menu items and more! Join us for Happy Hour food specials, Monday-Friday from 4:30pm - 7:o0pm at the bar! Call us to place a to go order. Crispy empanadas rolled in vegetable dough stuffed with shredded chicken and creamy buffalo sauce. Served with blue cheese. Corn tortilla chips covered with melted jack and cheddar cheese, tomatoes, scallions, olives and jalapeños. Traditional nachos topped with a mixture of seafood in a saffron cream sauce. Corn tortilla chips topped with your choice of chicken, ground beef, chili con carne, beef and beans or just beans, covered with melted jack and cheddar cheeses, diced tomatoes, scallions, jalapeños, olives and sour cream. Seafood mixed with a saffron cream sauce wrapped in flour tortillas, lightly fried and served with our homemade chipotle dressing. A piping hot 12" large flour tortilla folded around melted jack and cheddar cheese and onions, garnished with scallions and diced tomatoes. Zesty ground beef and bean chili with melted cheese; served with a flour tortilla. A blend of american cheese and jalapeño peppers. Our family's recipe blends fresh avocados, spices and diced tomatoes into a zesty dip. Refried beans whipped with cheese, onions, jalapeños and a blend of spicy seasonings. Crispy chicken wings served buffalo or BBQ style with celery and creamy blue cheese dressing. Jalapeños stuffed with cream cheese and dipped in premium gold tequila batter and deep-fried. Five shrimp stuffed with spicy cheese, wrapped in bacon, deep-fried and served with chipotle sauce. 2 camarones, 3 tequila poppers, 3 minichangas and a small cheese quesadilla. With avocado, chicken, and tomatoes, topped with melted cheese and corn tortilla chips. A heaping treat of Mexican favorites - A flour tortilla shell filled with our zesty beef and bean chili, shredded lettuce, jack and cheddar cheese, tomatoes, scallions, olives and jalapeños. Chunks of chicken, jack and cheddar cheese, avocados, diced tomatoes, scallions, and olives on a bed of crisp green lettuce. Crispy shredded lettuce tucked beneath our creamy seafood, cheese, tomatoes, scallions and olives. Crispy shredded lettuce topped with black beans, avocado, grilled marinated mushrooms, zucchini, squash, cheese, tomatoes, scallions and olives. Crispy shredded lettuce, tomatoes, scallions, olives and cheese. Shrimp sauteed with garlic, green peppers and onions, served with lettuce, cheese, tomatoes, scallions, olives and cheese. All standard entrees are served with Mexican style rice, refried beans and sour cream. Deep fried tortilla stuffed with your choice of chicken, ground beef, shredded beef, pork, beans or ground beef and beans, or shredded beef and beans, covered with secret sauce and melted cheese. Two crisp flour tortillas stuffed with special ground beef, shredded beef or chicken. Covered with guacamole and served with a touch of cheese. Two soft corn tortillas stuffed with specially prepared chicken, covered with green tomatillo sauce and melted cheese. Two poblano peppers stuffed with Chihuahua cheese, dipped in batter, lightly fried, and topped with enchilada sauce and cheese. Succulent chunks or pork, complimented with green tomatillo sauce, sprinkled with grated cheese, and served with two flour tortillas. A south of the border favorite. Shredded beef cooked with vegetables and spices. Sprinkled with grated cheese and served with two flour tortillas. Tender chunks of chicken, wrapped in a flour tortilla, covered with melted cheese. This favorite burrito is filled with seasoned ground beef, covered with melted cheese and topped with our homemade beef and bean chili. Lean diced pork simmered in a green tomatillo sauce and rolled in a flour tortilla. Covered with more tomatillo sauce and melted cheese. A large flour tortilla stuffed with grilled vegetables and topped with our special sauce and cheese. Two soft tortillas filled with battered and fried cod, lettuce and tomatoes. Served with refried beans, rice, guacamole and pico de gallo. A sizzling hot plate of sauteed peppers and onions with your choice of grilled chicken or grilled steak that is marinated in our secret family recipe. Served with lettuce, tomatoes, guacamole, sour cream, jack and cheddar cheese and three soft flour tortillas to let you build your own feast. Marinated portabella mushroom, squash and zucchini, grilled and topped with avocado on a bed of peppers and onions. Large flour tortilla stuffed with rice and refried beans, topped with our chef's special sauce, grilled vegetables, cheese, peppers and onions, served with guacamole and sour cream. Grilled and sauteed chicken breast with peppers, onions, garlic and jalapeños. Served with flour tortillas and sour cream. Three corn tortillas, layered with your choice of chicken, ground beef, beans or just cheese. Topped with our homemade enchilada sauce and served with rice and sour cream. Boneless, skinless chicken breast stuffed with Chihuahua cheese, wrapped in bacon and baked, served in medallion pieces, covered in our spicy homemade chipotle sauce and accompanied with rice and marinated vegetables. Two soft corn tortillas, stuffed with crabmeat and baby shrimp mixed in a saffron cream sauce, served on a bed of rice, topped with our special creamy spinach sauce and melted cheese, with a side of sour cream. Two tamales with your choice of chicken, pork, or grilled vegetables. Covered with our homemade tomatillo sauce and cheese. Served with beans, peppers and onions, sour cream, and guacamole. Grilled New York Strip steak sauteed with onions, garlic, scallions, salt and pepper. Served with rice & beans. Marinated boneless chicken breast, charbroiled and served with rice and our special honey mustard sauce. A salmon filet sauteed in white wine, butter, garlic and covered with chipotle sauce, served with rice and marinated grilled vegetables. Choose from the following to fill your selections: Ground Beef, Shredded Beef, Chicken, Pork, Refried Beans. Refried Beans with Shredded Beef or Ground Beef (Burritos Only). Cheese or Spinach & Mushrooms (Enchilada Only). Guacamole: Add $2.50 (Taco or Tostada Only). Seafood: Add $2.00 (Enchilada, Taco or Tostada Only). Soft Taco: Add $0.50. All served with Mexican style rice and beans. Corn Husk with your choice above (or veggies). Topped with our tomatillo sauce and melted cheese. A taco filled with your choice above. Topped with cheese, lettuce and tomatoes. A soft corn tortilla stuffed with your choice above (or cheese/spinach and mushrooms), topped with cheese, and served with lettuce and tomatoes. A soft flour tortilla wrapped around your choice above (or refried beans with shredded or ground beef combo), topped with sauce, cheese and served with lettuce and tomatoes. A crisp flour tortilla bowl filled with your choice above, topped with lettuce, tomatoes, cheese, olives and scallions. A succulent poblano pepper stuffed with Chihuahua cheese, dipped in batter, and lightly fried. Served on a bed of rice. Everyone's favorite! A large scoop of vanilla ice cream rolled in a coating of toasted corn flakes, cinnamon sugar and chocolate chips. Thrown in the fryer for a light crisping and covered in your favorite syrup! Our personal favorite. A flour tortilla stuffed with banana cheesecake, deep fried and rolled in a cinnamon sugar mixture. Topped with syrup of your choice! Crispy churros tossed in cinnamon sugar and served with a heaping scoop of vanilla ice cream. Topped with the syrup of your choice! Crisp flour tortillas that we cut up, deep fry, roll in cinnamon sugar and drizzle with your choice of syrup. Served with a scoop of vanilla ice cream. Simple but delicious! Our classic Mexican custard with hints of tequila, Grand Marnier, cream cheese and caramel. Fudge cake soaked with coffee liqueur and filled with chocolate mousse. Dipped in rich French ganache. Saturdays & Sundays from 11:30am - 2:30pm. Choice of meats: Chorizo, Chicken, Ground Beef. Stuffed with Mexican style scrambled eggs, your choice of meat or beans, rice, and our creamy queso blanco. Served with home fries. Two sets of flour tortillas layered with melted cheese with a teacup hole in the middle where a sunny side up egg is cracked. Topped with pico de gallo, avocado and chipotle mayo drizzle. Served with refried beans. Chorizo & beef patty with melted oaxaca cheese, zesty guacamole spread, crisp hash brown, fried egg and chipotle mayo. Served on a kaiser roll and with home fries. Mini churro shaped pancakes sprinkled with chocolate chips. Flash fried, rolled in cinnamon sugar and drizzled with caramel. Served with a side of fresh fruit. Join us for Happy Hour drink specials, Monday-Friday from 4:30pm - 7:o0pm at the bar! 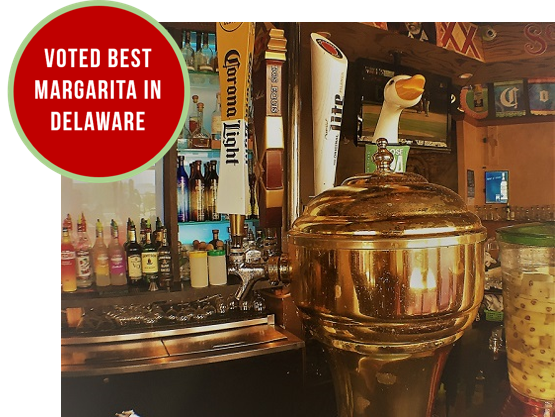 Try any margarita with our fresh lime juice! Margarita Pitchers available. Sangria and Wines also available. Cruzan Coconut, colada cream, pineapple juice. Available in any flavor. Cruzan Black Cherry, strawberry & raspberry puree and sour mix. Hornitos Plata, Rose wine, strawberry puree, simple syrup. Served blended. Captain Morgan, grenadine, lemon-lime soda, and a splash of Myer's Dark rum. Bacardi, simple syrup, lime juice, club soda and fresh mint. Served on ice. Cruzan Citrus, mango puree, sour mix. Served blended. Cruzan Vanilla, banana puree, sour mix. Served blended. Click below to see each type of tequila we offer. Most available in Silver, Reposado, Anejo.